How has the League Helped Improve Our Democracy? Ninety-five years ago, Carrie Chapman Catt called for a League of Women Voters to “finish the fight” to ensure that every eligible voter has free and fair access to the polls as well as to empower voters to influence their government to better serve their interests. The League’s first major victory came just six months later with the passage of the 19th Amendment, which secured women the right to vote. But that success was just the first of many. But that success was just the first of many. 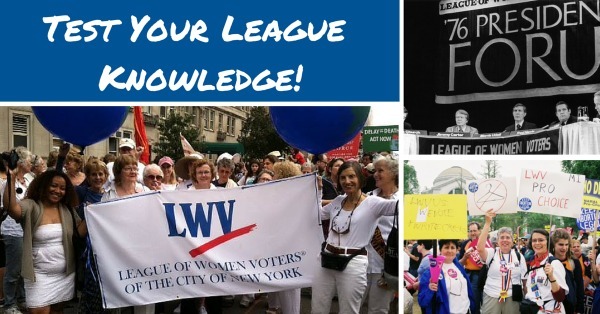 Since then, the League has been critical in Making Democracy Work® across a range of issues. How well do you know the League’s impact on Americans’ lives? Test your knowledge and learn more about just some of the League’s great accomplishments over the past 95 years!